Heavy-duty; yet lightweight portable this scale is suitable for almost any application requiring accuracy and medium to heavy weight capacity. The repeatability is unbeatable and will offer years of continued usage. It comes with an easy-to-read LCD display and operates on AC power. This medical scale is durable and reliable at an affordable price. Simplicity of design and rugged construction are the key features of the MS140-300 Portable Medical Scale. 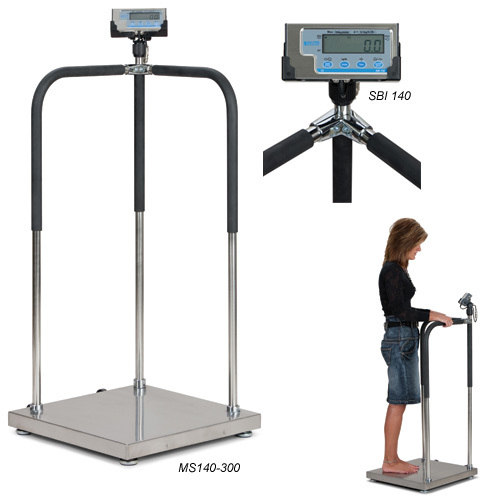 Featuring 20.5" 20.5"; low-profile (2.5" high) platform with sturdy handrails and padded grips; the MS140-300 digital scale was designed to be the perfect choice for clinics; health clubs; or even home use. This medical scale has the ability to print weight data offering real time saving device for doctor's offices; long-term care facilities; and other medical institutions. Packaging Dimensions– 46" x 24" x 6"